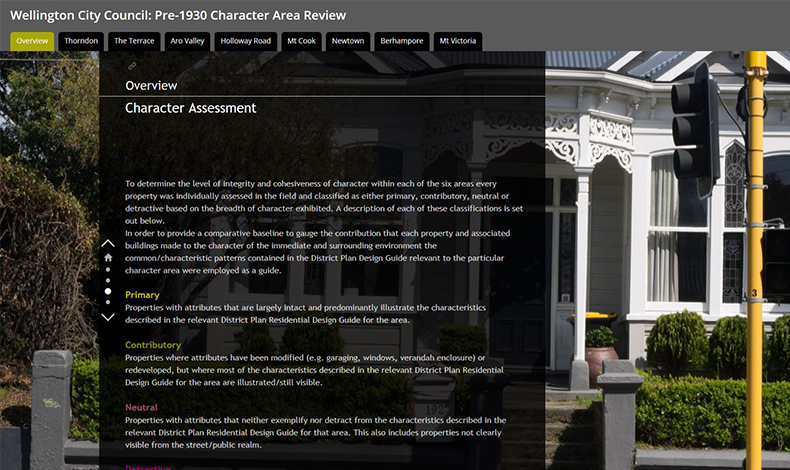 Wellington City Council (WCC) commissioned Boffa Miskell to undertake a stocktake of the six pre-1930 character areas contained in the Residential chapter of the Wellington City District Plan. The study included a review of the ‘on the ground’ character of these areas that primarily focused on the level of concentration of pre-1930 buildings, and the extent to which those buildings contribute to ‘townscape’ and/or ‘streetscape’ character. In additional to a comprehensive data set on the relevant properties, WCC wanted a flexible tool that would enable them to easily and effectively engage with a diverse range of audiences in real-time. It was also important that residents were able to access the information independently, rather than having to go to the council office, or being required to attend a scheduled engagement session. The review needed to display significant amounts of data in a way that would be meaningful at a range of scales – from individual properties, to streets, to the entire area. Taking a geospatial approach to data collection, analysis, field verification and reporting enabled the project team to deliver on all fronts. The project team configured proprietary software to create a cost-effective method of desktop data collection, which then freed time and budget for a comprehensive field verification of property data. Field verification was undertaken by 2-3 person field teams using an iPad app. Leveraging off the data collected, the ArcGIS platform enabled development of a series of area-specific dashboards with interactive charts and statistics. Using ArcGIS Story Maps to convey this information to the viewer provides a bespoke engagement tool that is intuitive to navigate and filter to find information.